The two main types of glass are Cathedral and Opalescent. Cathedral Glass - Transparent Glass, generally in a single color. Named for the original 'tinted glass' first used in 10th century European cathedrals. Normal house window glass would be considered 'clear cathedral'. Cathedral glass comes in a very wide variety of colors and surface textures. Opalescent Glass - Semi-opaque, with a milky appearance. Opalescent glass can be one solid color, but it is generally a mixture of two or more colors with streaks and swirls. True opalescent glass transmits very little light, however, opalescent stained glass is generally translucent. clear cathedral glue chip glass on the outside. background is pale purple cathedral waterglass. Translucent Glass - Transmitting light but with diffusion so as to eliminate the perception of distinct images. If you place your hand behind translucent glass, you can see it's shadow but can't see any of the distinct features. Used in panels and windows. Almost always the primary glass used in lamps. Streaky Glass - Made from stirring together two colors of glass, generally both opalescent type glass. The streaks produce another dimension to the artistic impression of the glass. For example, 'trees' made of a one color opalescent glass would look 'one dimensional' but when made with streaky glass they give the perception of having leaves and branches. Wispy Glass - Made from stirring together two colors of glass, generally one opalescent and one cathedral type glass. Similar to streaky glass, but to a lesser degree since cathedral glass is generally the 'background' glass. An example is light blue glass and wispy white glass used for the sky in a panel. The impression is of 'wispy' clouds. Textures - The surface texture of a type of glass. Most glass is generally smooth. While surface textures can be applied to either cathedral or opalescent glass, textures are generally used mostly on cathedral glass. The most common surface textures are waterglass and rough rolled. More exotic textures are Glue Chip, Artique, Baroque or Iridescent. Various types of textures are discussed and pictured below. This foiled balloon panel uses many types of glass. Translucent single color and streaky glasses were used in the balloon, so that the colors are more vibrant when light shines through the panel. The barn, fields and trees were made of streaky opalescent glasses. A light blue and white wispy glass was used for the sky. Finally, a very dark streaky glass was used for a border. The pattern for this panel is available in the pattern section of the website. Note: Glass pictures shown are of an 8" x 10" piece of glass. Artique - Often called 'semi-antique' this is a machine-made glass which resembles very expensive, hand-made 'antique' glass. Artique glass has a surface texture used mostly on cathedral glass which has very distinctive fine lines that lightly distorts the optical clarity. Artique glass is most often used as a background glass where some distortion is desired, such as in external house windows. Artique is a Registered Trademark of Spectrum Glass Company. Baroque - Unique textured glass with heavy surface texture and lots of swirls. 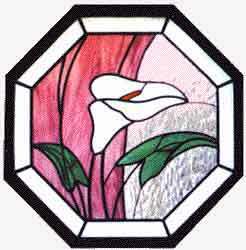 Most often made of light colored cathedral glass or a combination of a darker opalescent color swirled into a light cathedral background glass. Artique glass is generally used as a background glass where some distortion is desired, such as in external house windows. Also used where a special effect is desired. Baroque is a Registered Trademark of Spectrum Glass Company. Glue Chip - Texture created by applying glue to surface of cathedral glass. As the glue dries, the glue shrinks and bits of glass are chipped away, producing a 'fern-like affect. Used most often for background glass where medium optical distortion is desired. Clear glue chip glass is often used with bevels in windows. Granite - This texture is primarily available only in clear glass. It has a very heavy random bump pattern on the surface. The texture is similar to hammered, below, however, the granite texture is more intense and more random. Light diffusion and distortion is extreme. The heavily textured glass is often used as a background glass where significant optical distortion is desired, such as in bathroom windows. Hammered - A surface texture similar to hammered brass or copper. Small, round, smooth bumps applied to one surface of cathedral glass. Used most often as a background glass where a very heavy texture with significant optical distortion is desired. Also used in bathroom windows where significant optical distortion is desired. Iridescent - Not a surface texture, but a special surface finish. Finish produces a metallic sheen creating a rainbow affect. Affect varies depending upon the color of the glass it is applied to. Darker glass colors produce the most distinct rainbow colors. Much more subtle affect on lighter colored glass. See clear glass at left and black glass below. Generally used where a very special effect is desired, such as for angel wings or candle holders. Iridescent - Darker glass colors produce the most distinct rainbow colors from iridized glass. The rainbow affect is much more subtle on lighter colored glass. See black glass at left and clear glass above. Krinkle - This texture is available only in clear or mirror glass. It has a very heavy random line pattern on the surface. Light diffusion and distortion is extreme. The heavily textured Krinkle glass is primarily used as a background glass. Rough Rolled - A very common surface texture. This is a very slight texture added to the surface with a rough roller while the glass is molten. Most often used on cathedral glass. Smooth cathedral glass is often considered "one dimensional" as it has a somewhat flat look to it. Rough rolled cathedral glass is often used instead of smooth glass, since it has a very mild texture giving it another dimension and a very slight distortion to images seen through the glass. Seedy - A surface texture used on cathedral glass, which also runs through the interior of the glass. Small, air bubbles are trapped in the glass. Used most often for background glass where a very light texture with only slight optical distortion is desired.  Waterglass - By far the most popular surface texture. Surface resembles the rippling effect of water in light wind. Used most often for background glass where a very light texture and medium optical distortion is desired. Waterglass is a Registered Trademark of Spectrum Glass Company.